Harpagophytum procumbens is a perennial plant belonging to the family Pedaliaceae. It is native to the southern part of the African continent and may be found in the Kalahari sands of Namibia, Botswana, South Africa, Zambia and Zimbabwe. The plant’s common name, Devil’s claw, is due to the fact that its fruit is covered with sharply curved, woody, thorny barbs; it is also called the wood spider and grapple plant. Although the name of the plant comes from the appearance of its fruit, its medicinal properties are derived from use of its tuber. Devil’s claw is a ground trailing, weedy perennial about 18 inches long with a stout central taproot growing up to two meters deep. Secondary storage tubers, resembling elongated sweet potatoes, branch off horizontally. Leaves are large, have three-five lobes and are covered in white mucilaginous cells, making them appear a grayish-green colour. Flowers are trumpet shaped and pink, red or purple with a yellowish center. 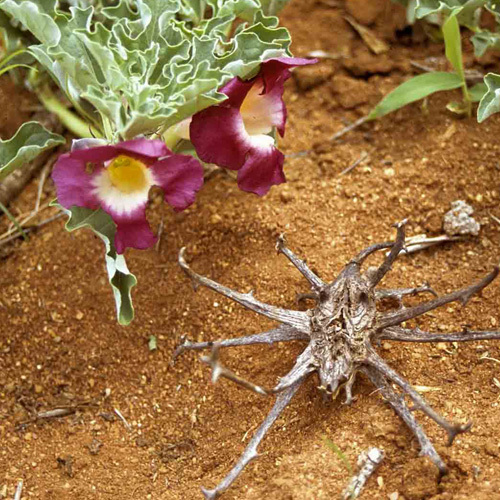 "Devil’s claw" is used in traditional southern African medical therapies for arthritis, low back pain, neuralgia, headaches, as a digestive aid and to reduce fever. The British Herbal Pharmacopoeia recommends Harpagophytum procumbens as a diuretic and sedative, while the German Food and Drug Administration as well as the Commission E approve H. procumbens for dyspepsia, appetite stimulation, and degenerative disorders of the musculoskeletal system. Devil’s claw has also been used for liver and kidney disorders, as a purgative, an oxytocin and as a topical agent to treat wounds and skin rashes. Clinical research has shown it to be effective for arthritis and rheumatic disorders. Carbohydrates: Fructose, galactose, glucose and myo-inositol (monosaccharides), raffinose, stachyose (46%) and sucrose (oligosaccharides). Diterpenes: 8,11,13-totaratriene-12,13-diol and 8,11,13- abietatrien-12-ol. Iridoids: Harpagoside (1–3%), harpagide, 8-p-coumaroylharpagide, 8-feruloylharpagide, 8-cinnamylmyoporoside, 6-O-p-coumaroylharpagide, 6-p-coumaroylprocumbide and pagoside. Phenylpropanoids: acteoside and isoacteoside, 6-O-acetylactcoside, 2,6-O-diacetylactoside. Other constituents: amino acids, flavonoids (e.g. Kaempferol, luteolin), triterpenoids, sterols. Other plant parts: The flower, stem and ripe fruit are reported to be devoid of harpagoside; the leaf contains traces of iridoids. Anyway the major chemical constituents of Harpagophytum procumbens are iridoid glycosides, sugars, triterpenoids, phytosterols and aromatic acids (caffeic, cinnamic and chlorogenic acids). The major chemical component thought to be responsible for the anti-inflammatory activity is harpagoside, a monoterpene glucoside. Secondary storage tubers contain twice as much harpagoside as the tap root. However, clinical trials have shown that constituents other than harpagoside, such as the triterpenoid glycoside β sitosterol, may also be responsible for the anti-inflammatory effect. bacterial mixture from human faeces. However, previous studies have shown that harpagoside could be denatured in the stomach. As this transformation of iridoids to aucubinine B has not been shown in vivo, the relevance of this data remains uncertain too. Devil's claw was introduced to Europe in the early 1900s and is stated to possess anti-inflammatory, antirheumatic, analgesic, sedative and diuretic properties. Traditionally, it has been used as a stomachic and a bitter tonic, and for arthritis, gout, myalgia, fibrositis, lumbago, pleurodynia and rheumatic disease. A review of clinical trials utilizing H. procumbens preparation for the treatment of joint and lower back pain found studies utilizing extracts containing 50-60 mg harpagoside daily gave more reliable data and were more effective at alleviating pain and improving mobility than extracts with lower amounts. The tubers contain a heterogeneous mixture of substances. All devil’s claw’s extracts are not equally effective; whole-plant extracts appear to have a better therapeutic effect than those preparated from isolated parts. Depending on the extraction process, the end product contains differing fractions of constituents with agonistic, antagonistic, synergistic or complementary analgesic or anti-inflammatory proprieties. The leading compound, harpagoside, belongs to the iridoid glycoside family and accounts for much of the extract’s effects. It has anti-inflammatory effects due to its action on eicosanoid biosynthesis. The majority of studies appear to indicate Harpagophytum procumbens is an effective anti-inflammatory and analgesic preparation in the treatment of acute and subacute inflammation such as rheumatoid arthritis and osteoarthritis. Clinical trials support harpagophytum procumbens as a beneficial treatment for alleviation of pain and improvement of mobility in a variety of musculoskeletal conditions. Analysis of in vitro and ex vivo studies indicate Harpagophytum procumbens has significant effects on numerous pro-inflammatory markers; however, a clear mechanism of action for the purported anti-inflammatory effects of devil’s claw has yet to be established. Harpagoside inhibits lipopolysaccharide-induced inducible nitric oxide (iNOS) and cyclooxygenase-2 (COX-2) expression via nuclear factor kappaB suppression, thereby inhibiting inflammation. Harpagoside appears to exert a peripheral analgesic effect. Human research has demonstrated decreased pain in knee and hip osteoarthritis and non-specific low back pain after ingestion of devil’s claw extracts containing harpagoside. Although the mechanism behind this effect has not yet been determined, it is thought to be closely connected to its anti-inflammatory proprieties. Animal research has demonstrated a significant antioxidant effect for devil’s claw extract when administered intra-peritoneally to rats. Dose-dependent increases in superoxide dismutase, catalase, and glutathione peroxidase where observed in rat brain tissue and a reduction in lipid peroxidation was also noted. The antioxidant properties may be partially responsible for the anti-inflammatory effect of devil’s claw extracts. The flavinoids (proven scavengers of free radicals) and plant phenols (hydrogen donors and oxygen radical neutralizers) present in devil’s claw extracts may be the constituents responsible for the observed antioxidant activity. The “bitter” action of devil’s claw provided by iridoid glycosides increases gastric acid production and stimulates digestion. So devil’s claw is an appetite stimulant , digestive tonic, liver and gall bladder tonic. In an adult case series, oral administration of Devil’s claw resulted in improvements in constipation, diarrhea, appetite and flatulence. Articular and inflammatory diseases, such as osteoarthritis and rheumatic arthritis are charaterized by a loss of cartilage due to imbalance between cartilage's synthesis and degradation. These diseases are associated with an increased release of cytokines such as interleukin-1beta and tumor necrosis factor-alpha (TNF-alpha). The increased release of cytokines leads to an increased production of degradation enzymes such as matrix metalloproteinases (MMPs). Osteoarthritis: is characterized by the breakdown and eventual loss of cartilage in one or more joints. In OA, the cartilage becomes brittle and degrades. Pieces of cartilage may even break away and float around inside the synovial fluid, which can lead to inflammation. The catabolism of proteins is due to an increase in proteases (MMPs) under the influence of cytokines (e.g. IL1-beta). Harpagophytum is chondroprotective , possibly due to inhibition of inflammatory mediators, including COX2, leukotrienes, nitric oxide, tumor necrosis factor-alpha (TNF-alpha) and interleukin-1 beta. In addition, matrix metalloproteinases (MMP-1, MMP-3, MMP-9) and elastase that play key roles in cartilage degradation are inhibited. There is not a traditional use of Devil’s claw as antiarrhythmic in humans. In isolated rat hearts, Devil’s claw extracts had a dose-dependent protective effect against arrhythmias induced by reperfusion; similar protective effects were found in isolated rabbit hearts subjected to arrhythmogenic chemicals. In low doses, Devil’s claw extracts had mildly negative chronotropic effects and positive inotropic effects; high doses caused a marked negative inotropic effect and reduced coronary blood flow. In normotensive rats, intraperitoneal injections of Devil’s claw had mild hypotensive effects as well as antiarrhythmic effects. Effects of the crude methanolic extract of harpagophytum procumbens secondary roots and two of its active principles, harpagoside and harpagide, on some smooth muscle in vitro have been studied. The results obtained show how the action of H. procumbens is due to a complex interaction between the various active principles contained in the drug and suggest that they, especially Harpagoside, interfere with the mechanisms that regulate the influx of calcium in the cells. Safety and adverse effects associated with the use of H. procumbens were examined in a 2007 review. The incidence of adverse events for H. procumbens was no greater than for placebo treatment in any trial. Minor adverse effects, mainly gastrointestinal in nature, occurred in three percent of patients. There were no reports of chronic toxicity. Currently no serious drug interactions have been reported for Harpagophytum procumbens. Evidence suggests that H. procumbens is an inhibitor of COX-2. This inhibition may increase the risk of bleeding when taken with drugs that also increase the risk of bleeding, such as NSAIDs or anticoagulants. H. procumbens extracts may lower blood sugar levels. Caution is advised when using this herb along with other hypoglycemic medications. H. procumbens may increase stomach acidity and therefore affect drugs used to decrease stomach acid secretion (e.g., H2 receptor antagonists, proton pump inhibitors, and antacids). Traditionally patients with gastric or duodenal ulcers, gallstones or diabetes are advised not to use these extracts. H. procumbens may affect heart rhythm and force of contraction; therefore, caution is advised for patients taking anti-arrhythmics or digoxin; infact on the basis of pharmacological evidence of devil’s claw cardioactivity, the possibility of excessive doses interfering with existing treatment for cardiac disorders or with hypo/hypertensive therapy should be considered. pregnancy and lactation: it has been stated that devil's claw has oxytocic properties, although the reference gives no further details and the basis for this statement is not known. In addition, there is no further evidence to substantiate the statement. However, given the lack of data on the effects of devil's claw taken during pregnancy and lactation, its use should be avoided during these periods. Devil's claw extracts can be administered in several forms. Dosage varies with each, depending on concentration of active constituents present. Devil's claw products may be standardized to contain a specific amount of harpagoside, and often contain greater than 1-2% harpagoside. Some studies have used a special preparation called WS 1531, which contains 8.5% harpagoside. Tablets : A dose of 600 to 1,200 milligrams (standardized to contain 50 to 100 milligrams of harpagoside) by mouth three times per day has been used in some research for joint and muscle problems. Dried root: Doses of 0.5 to 1.5 grams by mouth three times per day in an aqueous (water-based) solution have been used traditionally for appetite loss or stomach discomfort. Tincture: Doses of 0.2 to one milliliter (1:5 in 25 percent alcohol) by mouth three times per day have been used traditionally. Doses of three milliliters (1:10 in 25 percent alcohol) by mouth three times per day have also been used traditionally. Fluid extract: Doses of 0.25 to 1.5 milliliters (1:1 in 25 percent alcohol) by mouth three times per day have been used traditionally. The dosing and safety of devil's claw have not been studied thoroughly in children, and safety is not established. Brien S, Lewith GT, McGregor G Devil's Claw (Harpagophytum procumbens) as a treatment for osteoarthritis: a review of efficacy and safety.